I'm now cherrypicking DCUC, sticking mostly with Batman-related characters. Between his nominal status as a Bat-villain and his badass outfit, Deadshot was the only figure I planned to get from Wave Series 9. Of course, what were the chances I'd ever see one at retail, especially here in Boston? It usually takes months before a series shows up here - if at all - so imagine my surprise when I came across both Deadshot and Guardian at my local Toys Я Us. For some reason they're the only two I've seen so far (at a couple different TRUs). It's already quite evident Guardian will be a pegwarmer of Cyborg-like magnitude. Nothing's changed about the packaging since the first few series. Big blister, card on the back with pizza-slice views of the other characters and the BAF in the middle, along with a brief bio. While Deadshot has taken to wearing looser clothing in some issues recently, he still pulls out the spandex on occasion, and his outfit hasn't changed much since Lawton switched to it in Detective Comics #474, "The Deadshot Ricochet." The new tooling includes the head, torso, gauntlets, belt, calves and feet. I'm not so sure about the biceps - they resemble Deathstroke's, as does the torso, but it lacks the chainmail texture. The head looks great; once again the Four Horsemen have made it look like a person wearing a mask, rather than a faceless person. The details on the wrist-mounted guns go right down to the holes on the barrel shrouds. Mattel is improving in the plastic/paint department. Deadshot has relatively complex paint applications for a DCUC figure, and they all come out looking sharp. The red on his eyepiece and on the laser sights of the wrist-guns don't have any slop, and even the black "target" bits on the eyepiece are clean. However, the black lines on the wrist and lower torso, which I think are supposed to represent segmenting in the armor, are a little weak. There's also some black dry-brushing on the gauntlet guns that not only looks more like crayon scratches, but I can't really figure out why they even tried it. I suppose it's meant to represent natural wear on the metal, but as it is, the figure might have looked better without it. The yellow plastic used for the wrists and feet also suffers from the translucent effect often seen when parts are molded in those colors, and they make Deadshot look too toy-ish. 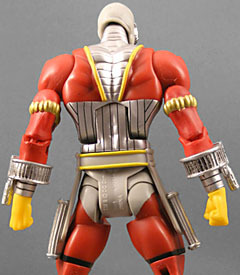 Deadshot has the standard DCU Classics articulation: a balljointed head, ball-and-hinge joints at the shoulders, H-hinges at the hips, standard hinges at the elbows, knees, torso, and ankles, and swivels at the biceps, wrists, waist, and lower thighs. My figure suffers from some warping on the lower legs that gives him a rather wide stance. It works for the character, though, so it doesn't bother me much. Aside from that, no issues. There are no accessories, aside from Chemo's arm. 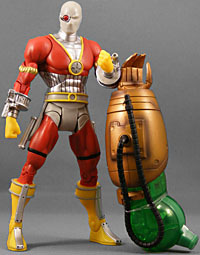 To be fair, since Deadshot carries his guns on his wrists, I'm not sure what accessories would have made sense. And Chemo appears to be a fairly large BAF, so the arm counts at least a half-more than usual in the accessories department. 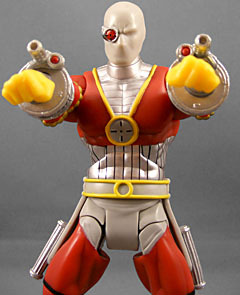 With his significant amount of new tooling, Deadshot represents a better value than many DCUC figures these days. While the yellow-molded parts make him look a bit too much like a toy, the coolness of the head sculpt and wrist-mounted weapons help make up for it. So, is he worth the $12 I paid for him? Yes. Would he be worth $15 if he'd come out a few months from now, after the price hike? Barely. 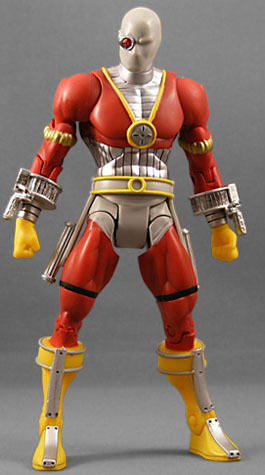 But a figure with less new tooling, like Wildcat, definitely wouldn't be.